Today was the first attempt at waffles in the vintage iron, and the results were pretty good. The iron smoked a lot while it was heating so I planned on tossing the first waffle anyway. Never having made waffles I wasn't sure how the batter should be - I made the KAF sourdough recipe and I thought maybe it was too thick. They puffed up beautifully and my food critics voted them excellent. One went with syrup, the other opted for agave. Any input on the batter consistency would be appreciated, A. Thanks, Keith. The waffles were certainly fluffy and pushed the top of the waffle iron up at they rose. Good to hear that there is some leeway, A. 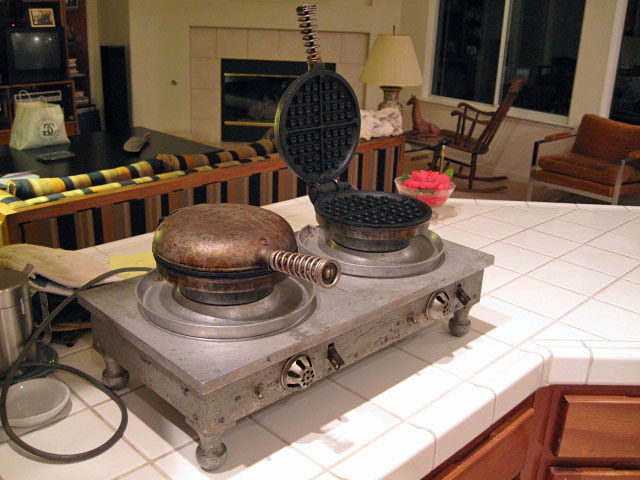 You may recall my ancient waffle iron story from January. No, the waffle iron isn't that old and it has a non-stick finish in good shape. I let it heat until drops of water skittered, which is what someone suggested as a good test. No thermostat, in fact no lights of any kind. Many thanks for the recipe link - I am making quite a collection. Guess I need to try them all but only when the grandgirls are here, not good for my (diabetic) diet! I do indeed remember your ancient waffle iron - you could really feed a crowd with that one. How often do you fire it up, or do you have a smaller one too? Thanks again, A. My waffle iron makes 2 waffles at a time, as you can tell. We have made waffles for 6 people, but some have to wait for theirs. We have no need for a smaller waffle iron, as long as my back holds out. I'd guess we make waffles once or twice a month. My baguette experiments have generated a generous supply of French Toast fixings. We used to make waffles more often. I think we have waffles about once a month, but since there are only two of us, I make just half of this really old recipe from Betty Crocker. It turns out surprisingly good and crispy waffles, and you don't even separate the eggs. My waffle maker (nothing special) is a Vitantiono Belgium Waffle maker (it makes 2 small waffles in about 90 seconds). I'm sure your recipe is wonderful, David, but if you want to make just a couple of quick waffles, you might give this old tried-and-true formula a try. Combine eggs and buttermilk, add butter, then mix in remaining dry ingredients, stirring only enough to combine everything--lumps will remain. Let rest for 10 minutes while you heat the waffle iron. Add blueberries, if desired, before closing the iron. Makes about six 4-inch waffles. A friend of mine showed me this recipe. I love the flavor the malt powder gives it. Its even better if you use Malt Syrup (harder to find). Combine flour, baking POWDER, sugar, and salt in large mixing bowl. IF using malt powder, add here. Stir together. Separate Eggs, putting yolks in medium mixing bowl (for mixing by hand). By hand, mix yolks, 1 ½ cup milk and melted butter (added last.). Save the last ½ cup of milk to tweak mixture later. IF you have elected to use Barley Syrup warm it slightly in a microwave (cover off) if it is cold. Add to the liquid mixture and stir well. Add liquid mixture to the dry mixture. Stir briefly. Resultant mixture should be slightly lumpy. Fold in whipped egg whites. Optionally, A ½ cup or so of frozen blueberries may be added here. I have also substituted 2 tsp of yeast instead of the baking powder - if you are willing to wait for your waffles. If using yeast, don't whip the whites until you are ready to fold them in.